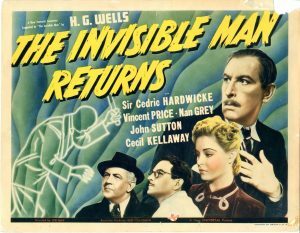 There are a lot of reasons why this 1940 sequel is better than the original INVISIBLE MAN. In the first movie, the Invisible Man was a dilettante, a haughty scientist who shot himself up with the invisibility drug “for kicks.” Claude Rains played the character with such a supercilious air that it was hard to care when he lost it all. But in this well-written sequel, the Invisible Man is a true hero. Geoffrey Radcliffe is a wealthy gentleman with class, courage, and a sense of humor. Someone has framed him for murder, and with the help of his devoted girl friend and trustworthy company doctor, he sets out to make things right. Vincent Price is perfect as Geoffrey. He gives this invisible man plenty of guts, along with goodness, humility, and a wonderfully self-deprecating sense of humor. When madness sets in, of course, Price can babble with the best of them. But this time around, you care. This is a man who ran his business empire for the benefit of the workers, a man who can tease his weeping girl friend about how “lucky” she is not to see his face. Ladylike and innocent-looking Nan Grey is a horror legend for her bit role as the waif-like streetwalker in Dracula’s Daughter. Here she gets to play the same gentle, sensitive type, only warmer and more womanly. Watching Helen Manson sit up all night watching over her suffering love, falling asleep in her chair, and fainting at the sight of his disfiguring bandages, you will fall in love with her yourself. It’s easy to see why Geoffrey loves her enough to risk madness and death to be by her side, and why the villain was willing to stoop to murder for her sake. Sir Cedrick Hardwicke is mostly remembered today for playing kindly, kingly old gentlemen in epics like THE TEN COMMANDMENTS. But here he is a ruthless, cold villain, a murderer who fights for greed and gain. The attraction to lovely Helen is only hinted at, just a glance here and a tender word there. But it gives just the right touch of depth and tragedy to an amazingly nuanced performance. Just as many critics feel Dracula’s Daughter was a deeper film than Dracula, so INVISIBLE MAN RETURNS may well be an improvement over the original classic.